HONOLULU -- As emergency shelters opened, rain began to pour down and cellphone alerts went out, the approaching Hurricane Lane started to feel real for Hawaii residents. Lane was forecast to continue its northwest turn into the islands Thursday and be the most powerful storm to hit Hawaii since Hurricane Iniki in 1992. President Trump declared a state of emergency in Hawaii late on Wednesday, authorizing the Department of Homeland Security and FEMA, to coordinate disaster relief efforts with the state. CBS News correspondent Mireya Villarreal reported that Honolulu has 150 FEMA emergency responders ready to go and the U.S. Navy has moved ships out to sea to avoid the powerful storm. 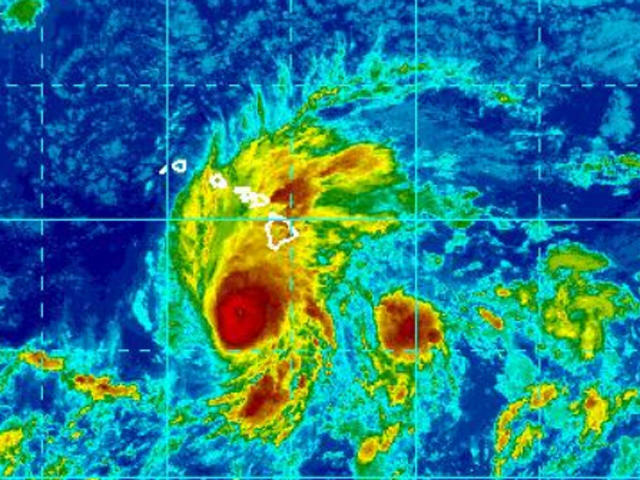 Forecasters warned that Hurricane Lane's "very close" pass on Thursday and Friday is slated to bring strong winds, torrential showers and monster surf to the entire island chain, as well the possibility of "significant and life-threatening flash flooding" and landslides. The Central Pacific Hurricane Center in Honolulu forecasts "total rain accumulations of 10 to 20 inches, with localized amounts in excess of 30 inches over the Hawaiian Islands." Officials opened shelters on the Big Island and on the islands of Maui, Molokai and Lanai on Wednesday. They urged those needing to use the Molokai shelter to get there soon because of concerns the main highway on the south coast of the island could become impassable. On the island of Oahu, which was put on a hurricane warning late Wednesday, shelters were scheduled to open Thursday. Officials said they expect that around 4,000 or 5,000 people will evacuate. Officials were working to help Hawaii's sizeable homeless population, many of whom live near beaches and streams that could flood. Officials warned the limited shelter space should be a "last resort" and aren't designed to withstand winds greater than about 40 mph. She was organizing important documents into a folder -- birth and marriage certificates, Social Security cards, insurance paperwork -- and making sure her three children, all under 4, have flotation devices such as swimming vests -- "just in case." "We're planning on boarding up all our windows and sliding doors," Napua Puaoi of Wailuku, Maui, said after buying plywood from Home Depot. "As soon as my husband comes home -- he has all the power tools." Heavy rains buffeted the Big Island Wednesday night, triggering flooding in some spots and forcing the closure of several roadways, reports CBS Honolulu affiliate KGMB-TV. The National Weather Service said rainfall rates of 1 to 3 inches an hour were being recorded in some spots.